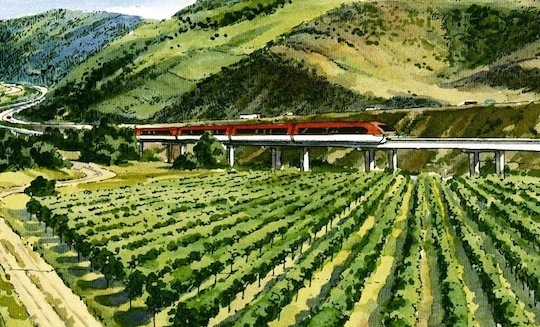 California's High-Speed Rail is one of the nation's most important and controversial urban projects in recent memory. Some hail it as a critical step toward reducing greenhouse gas emissions in a state of 40 million people, a stabilizing force for California's Central Valley and a critical link among cities in the region. Detractors call it a real estate development scheme, a boondoggle, an inducement to sprawl or simply a bad idea that diverts money from more worthy transit projects. As I have made clear in earlier posts, I believe in this project. I feel the current debate ignores many opportunities to push planning and urban development ideas forward. Join me for a vibrant discussion with two California planners who know a thing or two about the project: Egon Terplan, planning director at the San Francisco Planning and Urban Research Association, and Ian Carlton, vice president of Transit Communities. We discuss what the high-speed rail project really means for planning, cities, equity, sprawl and our ability to cope with uncertainty. Correction: In the discussion I (Alex) mistakenly state that France's TGV has been in operation for 40 years, but it has actually been operating for 30 years. Polis brings you this podcast in collaboration with CoLab Radio. Credits: Rendering from The Sacramento Bee. Fantastic! Keep these podcasts coming! Any high speed line minimizes the freedom of users while maximizing the power of planners/politicians. Robocars will make it obsolete before it is finished. In Europe and Japan users do not feel any lack of freedom at all. It has become a very convenient transport option: safer, more comfortable and faster than any other means. I am not holding my breath for robocars to totally revamp our transportation system. Sure, maybe the technological issues are being solved. But what happens when the first unsupervised robocar plows into a person and kills him/her? If your Windows-laptop crashes occasionally, what happens when a system crash on a robocar leads to an actual crash on the ground? As so often happens, the breathless techno-futurists breeze past the incredibly complex legal and political issues that would have to be solved. Legal/political progress definitely does NOT move according to the pace of "Moore's Law." But if we grant that robocars will sweep the nation, what then? Robocars would still need to drive on freeways, which will have to be vastly expanded at far greater cost than HSR if CA HSR isn't built. They'll still burn gas -- are we just going to pretend that there are no climate change or oil supply issues looming on the horizon?